After having x-rays and an MRI, it was found my ball and socket do not meet and I have nothing in between. 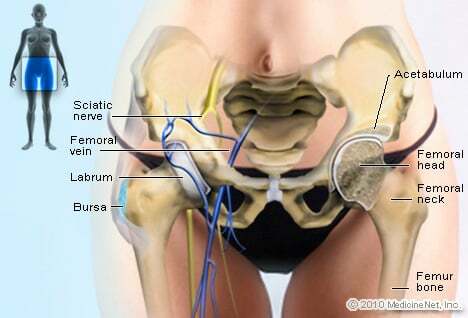 My hip is bone on bone and causes pain. We have tried a steroid injection into the hip, and physical therapy. I'm now due for a total hip replacement surgery in July. I stepped down wrong on a cement stair step, with a jolt to my left hip socket, which caused my hip pain. Always being in front of an electric fan causes my pain in the hip. Squatting to sit and lying down trying to turn over cause hip pain.